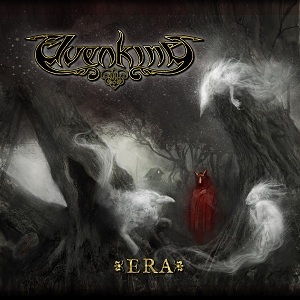 Italian band Elvenking formed in 1997. If you're guessing from the name that they're Power metal (a genre rich in elves, dragons and other mythical or fantasy creatures) then you're almost right. They are a folk/power metal band. They released their first alvum (Heathenreel) in 2001, and have released albums at regular intervals since then. Era is the bands seventh album. Elvenking have a couple of guest stars on the album - Teemu Matysaari (Wintersun) contributes a guitar solo, and the awesome Jon Oliva (Savatage, Trans Siberian Orchestra, Jon Oliva's Pain) sings on two of the songs. Listening to the album, it's definitely more Power metal than Folk metal, although the folk part does show through at times. "The Loser" has a folk feel at the beginning, but this is soon swamped by the power metal aspects and the song becomes power metal with a hint of folk. The folk instruments fo come back in to play more of a part later on in the song, but really the folk elements are quite limited here. This isnt a nad thing, just a comment that the song (and indeed the album) is Power Metal with a hint of folk rather than being full blown folk metal. Jon Oliva sings on two tracks, “I am the Monster” and “Forget-Me-Not. His vocals do add to these songs - they aren't here just for the sake of having a special guest on the album. The vocals throughout the album are excellent, and stand up well to comparison with Jon Oliva. Having Jon Oliva sing on the same song must be daunting for a vocalist, but Damna does well in the comparison. The guitar work is excellent throughout, and the use of the violin, pipes and other folk instruments does take the album away from being a plain power metal and give it a folk flavour too. The folk elements are quite limited, but that simply means that the album stays in the power metal camp but with a folk influence, whereas too much use of the folk elements would push the album more into Folk Metal territory. It's a difficult balancing act, but Elvenking have done a great job here and made sure their album has a distinct sound and stands apart from other power metal albums and folk metal albums. A great album that will appeal to Power Metal fans and also to Folk Metal fans. Well worth a listen. Era will be released on 14th September 2012 via AFM Records.